Castle Lager Better Bites is available for purchase at five tavern outlets in Soweto. 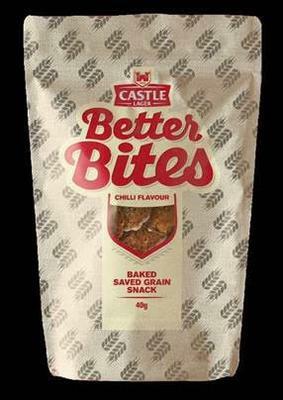 South African Breweries and AB InBev are piloting a savoury snack made from locally grown grain and the proceeds of their sale will be used to help develop emerging farmers and support community development initiatives, the companies said. Castle Lager Better Bites is available for purchase at five tavern outlets in Soweto and another four liquor outlets between Johannesburg and Pretoria. The concept for the snack came about after AB InBev identified challenges faced by emerging farmers in establishing viable, sustainable, and successful farming practices. The project is in partnership with FarmSol Africa and Grain SA who will help train emerging farmers who are part of SAB and AB InBev’s supply chain to improve productivity. It is expected to unlock more than R280,000 in funding to support the cost of the training. Some 142 independent black emerging farmers have been identified as beneficiaries of the initiative, including 82 women from KwaZulu-Natal, Gauteng, and Mpumalanga provinces.